^ 2.0 2.1 US Gazetteer files 2010. United States Census Bureau. [2013-01-25]. 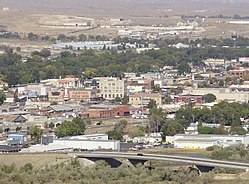 ^ Profile for Elko, Nevada, NV. ePodunk. [September 26, 2012]. ^ ELKO WB AIRPORT, NEVADA - Climate Summary. wrcc.dri.edu. [2010年6月6日]. ^ NowData - NOAA Online Weather Data. National Oceanic and Atmospheric Administration. [2012-04-18].